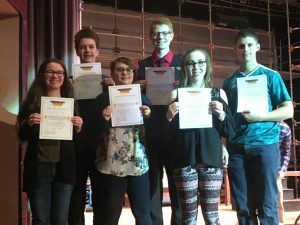 Hawks News · Apr 8 GHS/GMS at German Speaking Contest April 6!! Congratulations to the following Greenfield High School and Middle School students who placed at the State German Speaking Contest at Menomonee Falls High School on Saturday, April 6, 2019. * Eric Effinger and Maya Thuene-Baillargeon placed 1st for Level 4. * Isabella Lubotsky placed 3rd for Level 4. * Joseph Karcher placed 3rd for Level 3. * Spencer Thusius and Connor Schmidt placed 3rd for Level 2. * Avria Smudde placed 3rd for the Middle School Level.